Lightly-tinted formula for a natural glow. With Mexoplex (a complex that contains Mexoryl SX) to provide high broad spectrum sun protection against the harmful effects of both UVA and UVB rays. Contains Thermal Spring Water. Anthelios efficacy has been demonstrated via clinical studies carried out in-vivo on subjects suffering from sun intolerances, particularly those caused by UVA rays. Anthelios products all have a high PPD (Persistent Pigment Darkening) factor, offering one of the best protections against UVA offered by any brand in the world. The brand was also the first laboratory to use Mexoryl SX. Apply the sunscreen product just before exposure. Re-apply frequently and generously to maintain protection, especially after swimming, perspiring or towelling. Avoid eye area, in case of contact with eyes, rinse them immediately and thoroughly. Over-exposure to the sun is dangerous. Keep babies and young children out of direct sunlight. 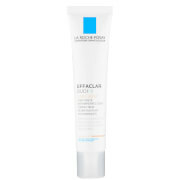 Do not stay too long in the sun, even while using a sunscreen product because it does not provide 100% protection. This is incredibly light and literally runs out of the bottle. Works for me as I have quite a few serums and moisturiser that I apply before this so don't want anything heavy. It is a bit tricky to apply due to the liquid nature but I just put it on with my hands. Colour is fine and seemed to match my fair-ish skin well. It comes out very liquid so you have to be a bit careful but it gives lovely coverage and sinks into the skin beautifully. It is slightly tinted but just enough to be flattering, not fake tanned! It lasts all day, doesn't sweat off (I tested it climbing a mountain in very hot weather!) and small pleasant without being over-powering. I wish I had found it years ago instead of struggling with stinging eyes, whiney face and smelling like I'm on the beach. I didn’t except to love this so much but - WOW! This makes my skin look so healthy and glowy; I use it instead of foundation most days now. It doesn’t give much coverage but seriously evens out the skin tone and makes you look so fresh. It also has SPF 50 so it’s a win-win! I do not like sunscreen cause of their oilness and also do not use any foundation as it seems to be always too visible for me. 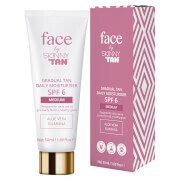 This product is the best for both problems - it has spf 50 and you dont feel that oily, and it gives you beautiful shiny natural glow with a bit of tint that is perfect! Have been using for almost a year now, bought a few of them, and at the same time you dont need a lot of product, so it will last for long time! BEST!!! This sun cream feels very light. It glides on smoothly and absorbs fast, so you can apply make up over the top within a minute or so. The tint means that on casual days, you don't need to apply base because it evens out your skin tone beautifully and gives a lovely healthy glow. And at a god price too! Used this twice and seems to go on nicely. No bad effects on my breakout prone skin. Works brilliantly as a sun cream and has a very pleasant smell, however offers very little/no coverage despite there being a slight tint. 19/06/16 by mommy of 3! the product is very fluid and offers good coverage without being sticky or too heavy. 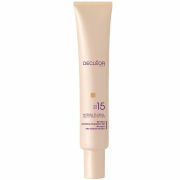 The tint is delicate and very natural, a good option for those who do not like to appear too pale when wearing SPF50. I haven't gotten a tan while using any of the Anthelios range (granted, I do not tan very easily, and am quite rigorous with my sunscreen applications) and this is no different. I like that it is tinted so it doesn't leave that notorious white cast that sunscreens can sometimes give you. The fact that it is so very fluid means that it spreads out very evenly, and isn't greasy!